[ This is an unofficial entry into Dad's Parade of Vehicles. The story goes that he traded temporarily his current MG for this Bugatti. The arrangement lasted just a week or two, as far as the car was concerned. I don't know about the dame. She looks pretty classy so I assume the Bugatti was hers. They seem quite chummy and carefree, he with his longneck bottle of stout and she with a cup of something from a flask. I think this was during Dad's Hong Kong chapter and therefore, whenever I see trees and mountains, I identify it as Kowloon. (If it's England, let's call it the Cotswolds.) I could be wrong on so many of these important details. Bugatti is a French marque, by the way, contrary to one's instincts, though when founded in 1909 in Alsace, it was part of Germany; how confusing. No idea whence the lady hails nor her destination. Make up your own story. As to the Bugatti's specific model, I have pored over hundreds of pictures and narrowed it down to this: 1936ish Type 57 four-door (Berline style -- not a Coupé Atlantique or Atalante). Differentiating details from other models: Four doors, hinged on center B-pillar (making front doors suicide); engine compartment side vents vertical orientation (tilted back somewhat); chrome headlights, long bullet shape, mounted high on wings/fenders; wide C pillar, fairly vertical; little fixed window of rear doors narrower/pointier than on others; side trim line incorporates rear door handles and gently curves into top of rear fender; running board; no rear wheel fender skirts. 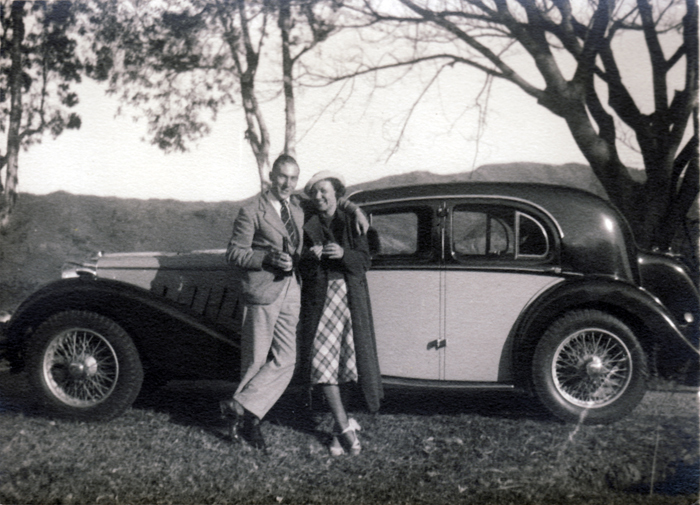 Ettore and son Jean used many different coachbuilders so this could even be a one-off.